The Charity stamps of Colonial Australia. The 1900 Patriotic Fund issue of Victoria - other frankings. As with the single frankings of the 1d (1/-) and 2d (2/-) stamps, the combination and mixed frankings involving both stamps are generally philatelic although some do appear to have a genuineness about them. 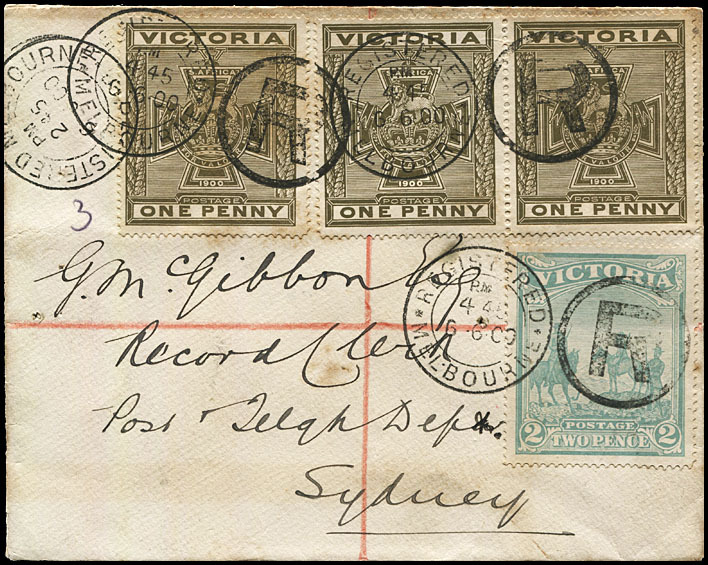 It is estimated that there are less than 12 covers with both stamps from the 1900 Victorian Charity issue. 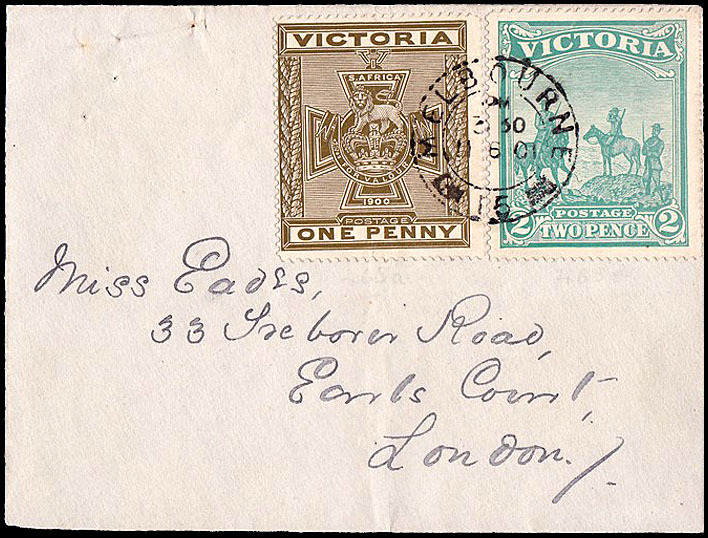 Of the six covers shown below, three have international addresses and appear to be genuine postally used. The Charity stamps did not however have validity for the payment of international postage!!! 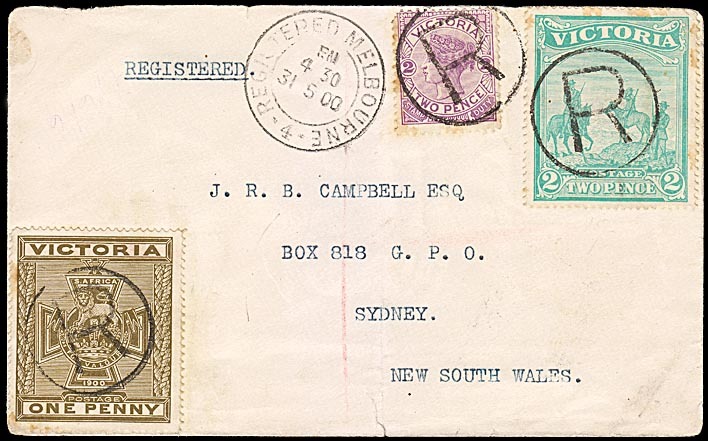 The other three covers shown below have inter-Colonial/inter-State addresses (Tasmania and New South Wales). mixed frankings of both the 1900 Victorian Charity stamps with another issue. 2d inter-colonial rate: 1d overfranking for a philatelic cover. Prestige Philately October 2010 Lot 339. One of three covers recorded with a 1d pair. Status Auctions August 2015 Lot 1516. Inter-colonial letter rate: 2d; Registration fee: 3d. Both Charity stamps with a Naish 2d violet. Phoenix Auctions December 2013, Lot 893. Euroa to Junee and redirected to Sydney. 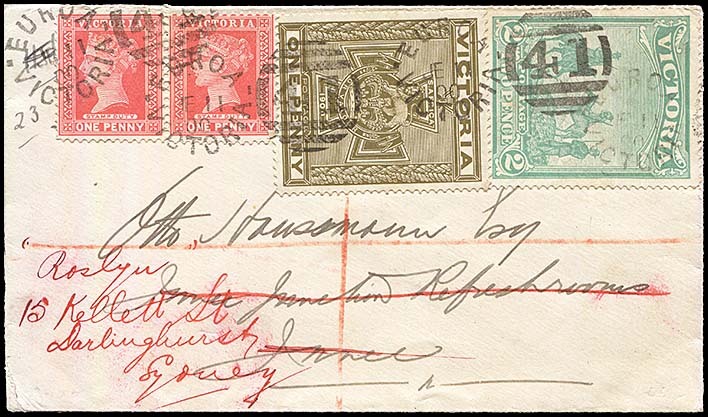 A registered letter with both Charity stamps together with a 1d rose-red Naish design avd cancelled three times with an unframed Euroa date stamp. Has backstamps for Melbourne 5:30 am on 12 June), Junee (4:30 pm 12 June) and Sydney 14 June). A genuine postal use of the Charity issue. Spink May 2018 Lot 347. Melbourne to Batavia (Jakarta), Java. 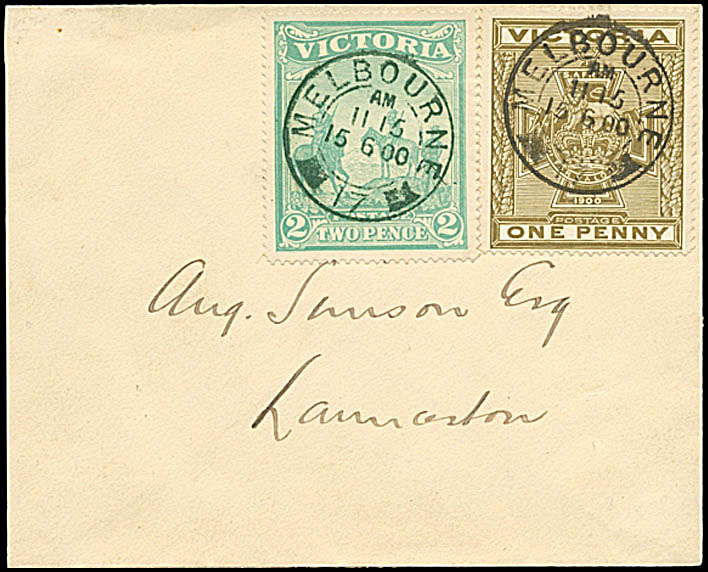 Cover sent to the Eastern Extension Telegraph Company which operated the telegraph cable connection to Darwin and to Broome. 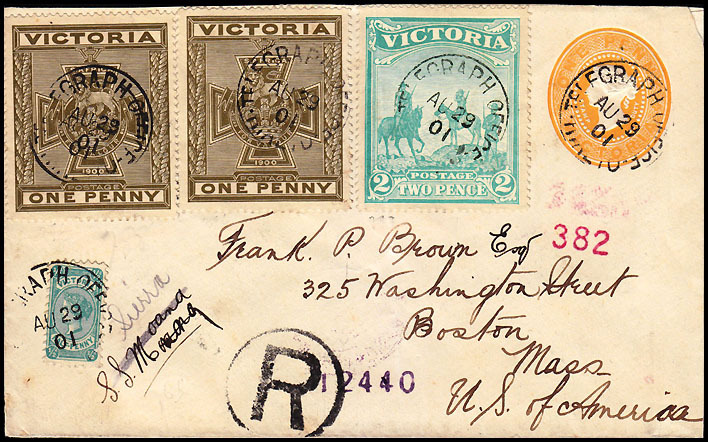 Mixed franking with 2½d Tannenberg paying the postage rate and the 3d Naish paying the registration fee. The Charity stamps are just decoration as they had no postal validity to an overseas destination. 29 August 1901 (with Telegraph Office date stamp). 5½d registered foreign letter rate: Foreign letter rate: 2½d; Registration fee: 3d. Both Charity stamps with a contemporary ½d uprating 1d orange envelope. Use of the Charity stamps to pay the overseas rate after Federation. It may have been thought that, as Colonial stamps were interchangeable, they might then have been valid for overseas purposes. Site map: Home 1897 NSW 1897 Victoria 1900 Victoria 1900 Queensland Return to top. Designed, developed and © by James N. Johnstone.